firecracker flower Crossandra leaves & flower is from the Greek κροσσοι (krossoi), tassels, a fringe, and ανδρα (andra) from ανηρ (aner), a man, referring to the fringed anthers; and the tongue-twister infundibuliformis is from the Latin infundibulum, a funnel and forma, a shape – funnel-shaped. This is a tropical flowering perennial shrub, native to southern India, Sri-Lanka and tropical Africa. It is quite low in habit, growing only from 30 cm to 90 cm in height, depending on the cultivar; it spreads to about the same width as its height. It likes lots of rain, sun and humidity. flower spikesThe foliage is dark green and glossy, with oval leaves (some cultivars have ruffled leaves) about 5–12 cm long, somewhat resembling the leaves of the coffee plant. The fragrant flowers are unusually shaped with asymmetrical petals spreading to form a 3–5-lobed disk, arising from slender long corolla tubes, about 2 cm long, that sprout from 10–15 cm long 4-sided spikes. Flower colours range from the common orange to salmon-orange or apricot, coral to red, yellow and even turquoise. The fragile flowers are easily damaged by rain, but otherwise can be quite long-lasting. 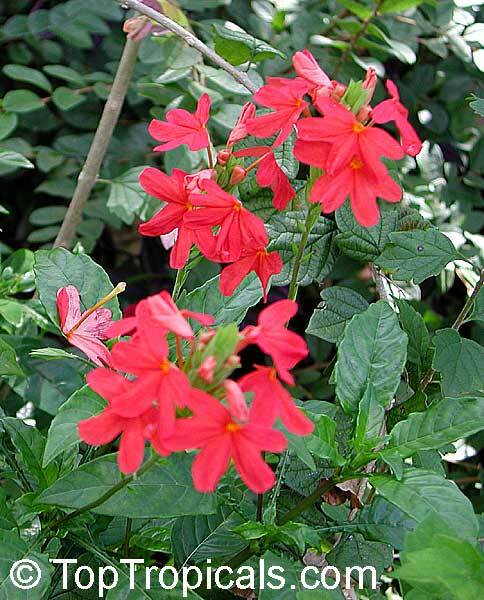 These plants are generous bloomers for most of the year, often beginning to bloom when only a few centimetres tall. They are often grown as container plants, especially the dwarf cultivars that grow only to about 45 cm. The flowers are very attractive to insect pollinators, especially to butterflies and dragon flies. The plant likes full sun to semi-shade. 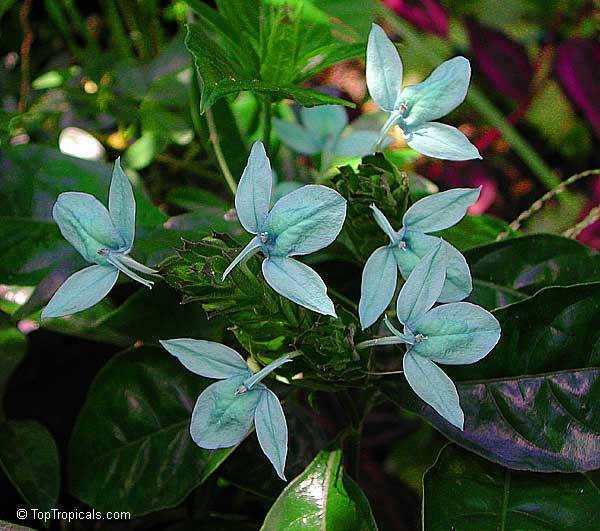 • Shamrock (Green Ice Crossandra, Turquoise Cassandra) – turquoise flowers. The ‘Firecracker Plant’ name comes from the plant’s method of seed dispersal. The fruits dry out on the plant. When the dry fruits become wet from rain, the seeds inside explode out, and can be flung out of the fruits for quite a distance – even up to 3 m. This is an excellent method of seed dispersal, as the seeds are thrown out into an environment that has been made wet by the rain, and thus the seeds can propagate quickly. Gardeners often propagate the plant by tip or stem cuttings taken when old plants are pruned in spring. In its native environment, Crossandra infundibuliformis is a vigorous and enthusiastic grower, and its flowers are harvested for decorating women’s hair.